Sport Definition BCAA MEGA DOSE 1200mg - 120 kaps. High quality BCAA branched amino acids in capsule form. The optimal ratio of 2: 1: 1 (for L-leucine, L-isoleucine and L-valine) provides strong anti-catabolic properties, promotes recovery and away the feeling of fatigue in training. Contains added vitamin B6, supports the energetic processes of the body! High quality BCAA branched amino acids with the addition of agmatine and CLA! It helps protect muscles against catabolism, supports muscle growth and regeneration! 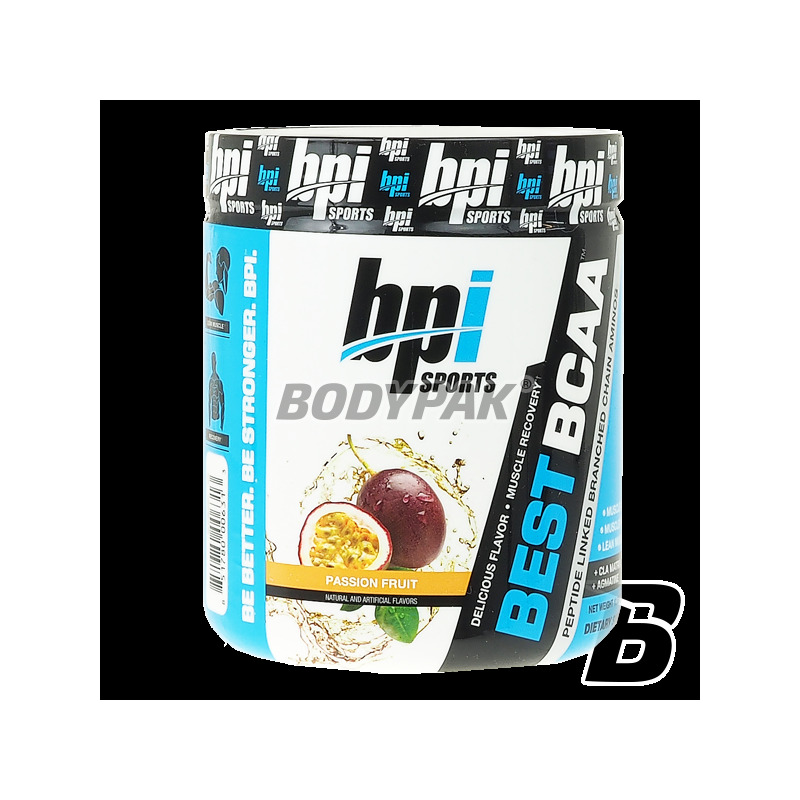 BPI Best BCAA dietary supplement - branched chain amino acids BCAA in powder form with the addition of CLA and agmatine. BCAA branched amino acids make up more than 30% of lean muscle mass. Intense training leads to the exhaustion of energy reserves, as well as the reduction of branched chain amino acids. Reducing BCAA limits the process for the synthesis of proteins, which in turn leads to a decrease in efficiency of the body tissue and reduce mięśniowej.Aby block the appearance of adverse catabolic state and to increase muscle protein reconstruction should provide branched chain amino acids. 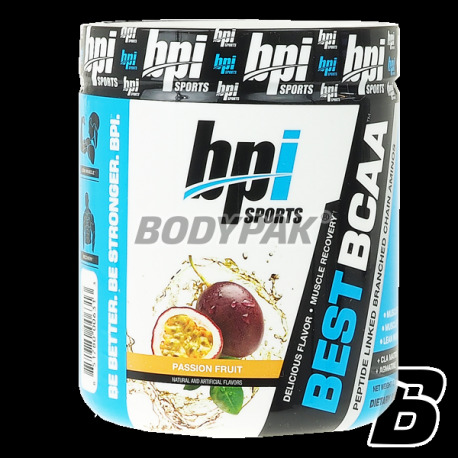 BPI Best BCAA is designed to support the effort in all sports with a high-intensity workout. It enhances the growth of muscle mass and strength and increase physical fitness. BPI Best BCAA contains CLA (conjugated linoleic acid), which can help improve muscle growth. Other ingredients: Oligiopeptide-Enzymatic Technology ™ (potassium hydroxide, stearic acid, sodium carboxymethylcellulose, crospovidone, natural wax, carboxylic acids, polyethylene glycol, dicalcium phosphate), maltodextrin, citric acid, natural and artificial flavors, malic acid, silica, a mixture of błoników (cellulose gum, xanthan gum, carrageenan), sucralose, acesulfame K, Allura Red AC. Allura Red AC - may have an adverse effect on activity and attention in children. BioTech BCAA 6000 - 100 tabl. BCAA are very popular supplement protecting the body from catabolism. Choose the best possible product, select just the supplement. With high-quality amino acids you are sure of their actions. Formula 3 is branched chain amino acids in a ratio of 2: 1: 1 with a specific dose of glutamine per serving! Effective mix of anti-catabolic sensational price!cyjnej cenie! Nutrend BCAA 2:1:1 - 150 tabl. Excellent BCAA Nutrend released by the company in a convenient pill form. Good absorption of each serving. Quickly assimilates and inhibits catabolism! The powder form allows freedom barns dose for individual needs! The unique composition of amino acids in a highly absorbable liquid form - liquid amino. Cheap amino acids Liquid Liquid BCAA is an excellent source of essential branched chain amino acids. They provide protection against catabolism and accelerate recovery! BioTech BCAA 3D - 90 kaps. Probably the best BCAA amino acids available on the market! Invest in world-class product! This will protect you from post-workout catabolism. Ideal proportions in the product provide the best possible performance. Top quality branched chain amino acids BCAA supplement enriched with Vitamin B6. Swanson AjiPure L-Methionine 500mg - 60 kaps. High quality l-methionine produced by natural fermentation! Pharmaceutical quality characterized by 100% cleanliness. It affects the maintenance of homeostasis and proper functioning of the whole body.